We had originally 65 students enrolled in Summer School. These are children ages 4-14. The flu that has been going around Akumal hit the library really hard, both Diana and I got it, and we had a lot of absent kids. Aug. 4th was the big fiesta and certificate day. We had 10 4-7 year olds. About 12 8-11 year olds. And only 4 11-14 year olds. Several of the kids were not there because of illness. We had a huge tres leches and chocolate cake and 6 huge pizzas donated by Lol Ha. All of the kids received individually wrapped gifts, small bag of candy and their summer course certificates. 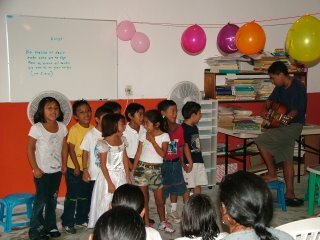 Several of the parents were present and the kids in each group sang 2 songs that they had learned. It was very entertaining! About Summer School - the 4-7 year olds worked on learning the alphabet. They learned numbers and adding and subtracting. They learned their colors. They all learned how to write their names and they sang 1 song a day. They were read a book every day- which they loved! And with their alphabet in tact - they learned to play "Hang man." The older kids had similar curriculums, a lot of science, ecology and botany. They had several creative writing projects, they played soccer once a week, they learned new songs and they all attended a lecture by Hilario with slides on the topic of Mayan culture. Afterwards this sparked an interesting discussion - I asked the kids who was born in Yucatan state (only 1!) the majority were born in Cancun! Most of their grandparents and about half of their parents spoke Maya at home. About 6 kids spoke some Maya. Carlos challenged them at this point (and basically taught them a good technique for learning any new language) and asked them to learn 2 Mayan words a day for the remainder of the course (2 weeks to go). 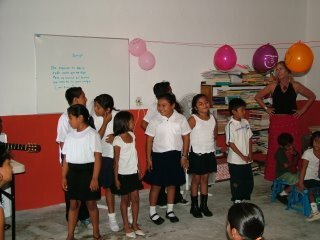 So most of the kids also kept a list of Mayan words in their notebooks. Overall, I am very proud of them - they worked hard and did learn some things. How wonderful. Sounds like the kids had a terrific summer. Thanks for all you do. Hi, is your needs list still current. My family and I will be in the area in October/November and I thought we would bring a few things.